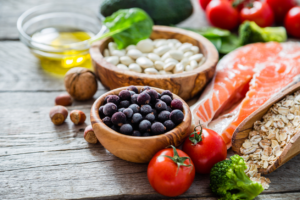 A functional nutrition approach uses various techniques to provide a customized treatment plan. A functional medicine doctor along with the nutritionist will evaluate medical history, review medications and supplements, provide an in depth look at diet & lifestyle, review and request labs and determine the patients ability to comply to standards of care. Functional medicine doctors and nutritionists will determine the best individual plan for you. After the evaluation, recommendations will include: custom diet and elimination program, strategies to stay compliant, specific supplements to increase strength of program, and education about the recommended style of eating. Functional nutrition does not treat a single symptom. It dives deeper into the root cause of illness to treats underlying problem. For example, many people present symptoms of heart disease such as high blood pressure, heart palpitations, chest pain, and fatigue. A functional nutritionist will determine what causes these symptoms and treat the entire body. Functional medicine doctors considers the body as one whole organism instead of isolated symptoms. One area of the body we play particular close attention to is the digestive system, also known as “the gut.” The gut is a common root cause of inflammation. Inflammation inside the body can present many symptoms. Even seemingly unexplained illness like autoimmune disease, anxiety, hormone imbalance, and many more can be caused by inflammation driven by gut dysfunction. At Dr. Cynthia Thaik’s office, we pride ourselves on taking extra care with each and every patient. Functional medicine and functional nutrition allows us to spend more time with each patient and truly get to the root cause of illness using lifestyle approach to health.